House Republicans want to kill the state and local income tax deduction. But apparently not for everyone. Their tax reform bill, being debated this week by the Ways and Means Committee, would repeal the federal tax deduction that people get for paying state and local income taxes, and it would curb how much they can deduct in property taxes. The tax break known as the SALT deduction is one of the most controversial revenue raisers because it is near and dear to taxpayers -- and lawmakers -- from highly taxed areas across the country. Today, just under 30% of filers claim the state and local tax deduction on their federal returns, according to the Government Finance Officers Association. 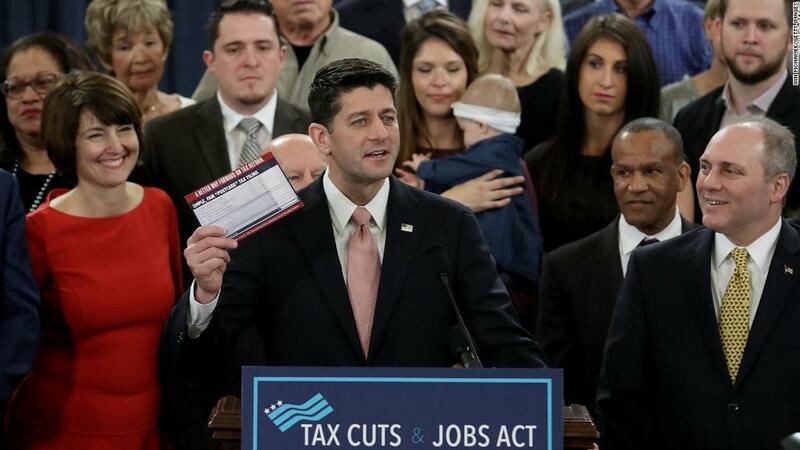 But tax experts have spotted what appears to be a big exception to the repeal: The owners, shareholders and investors in so-called pass-through businesses would still be allowed to deduct their state and local taxes in full. The provision allows the deduction if the state and local taxes are "paid or accrued in carrying on a trade or a business ... [or on expenses related to] production of income." As for everyone else who currently takes the SALT deduction? Sorry, Charlie, no can do. Pass-throughs make up the majority of U.S. businesses. They take the form of sole proprietorships, LLCs or S corps. And those with an ownership stake in them pay taxes on the entity's profits on their individual returns. So for them, under the House bill, state and local taxes could be treated as a business expense on their personal return. That would include President Trump, who typically structures his businesses as pass-throughs. But ordinary employees of such businesses would still be barred from taking the deduction against their wages. A spokesperson for the House Ways and Means Committee confirmed to CNNMoney that "all" pass-through owners and investors "will continue to be able to deduct state and local taxes incurred in the conduct of a trade or business." But the provision as written raises big questions for tax policy watchers. A key one is whether professional service firms, which are often set up as pass-throughs, would qualify for the SALT deduction. Professional services include firms providing financial services, legal services and consulting. The SALT provision in the House bill doesn't explicitly say they're not eligible and the word from Ways and Means is that "all" pass-throughs could take the deduction. But -- and this is where it gets tricky -- another provision in the House bill flatly precludes professional service pass-throughs from taking advantage of the proposed new 25% rate on pass-through profits. When asked about this at a House Ways and Means hearing Monday, Thomas Barthold, chief of staff at the Joint Committee on Taxation, seemed to indicate professional service providers -- such as partners in a big law firm -- likely would not be allowed to deduct their state and local taxes because all their income would be taxed as ordinary income, and would not receive the special 25% pass-through profits rate. "There's nothing in the legislation providing that. [A professional services firm] is still a trade or business that's a pass-through," said New York University Tax Law Professor David Kamin, who formerly served as a special assistant to President Obama for economic policy. When asked to settle the issue, a spokesperson for Ways and Means wasn't immediately available for comment. Kamin believes the exception to the repeal -- if that's what the tax writers truly intended -- would result "in deep unfairness and plenty of gaming."